A truly unique and very limited edition zombie head case created and designed by McFarlane Toys will also be available as Blu-ray only for a SRP of $99.99. Pre-book is August 1st. The 4-Disc sets will contain all 13 episodes of the second season and will be loaded with exclusive behind-the-scenes footage, featurettes and audio commentaries. The Walking Dead: The Complete Second Season is the much anticipated next chapter to the acclaimed post zombie apocalypse series. When we last left the The Walking Dead, the characters were in the midst of a high-intensity struggle to survive, fleeing the CDC as it burst into flames. In Season 2, they are still fighting zombies, and each other, facing more threats and obstacles than ever before. Based on the hugely successful and popular comic books, written by Robert Kirkman, AMCs The Walking Dead captures the ongoing human drama after a zombie apocalypse. The series follows a group of survivors, led by police officer Rick Grimes, played by Andrew Lincoln (Love Actually), who are traveling in search of a safe and secure home. However, instead of the zombies, its the living who still remain that may be the biggest threat. Jon Bernthal (Rampart) plays Shane Walsh, Rick’s sheriff’s department partner before the apocalypse, and Sarah Wayne Callies (Prison Break), is Rick’s wife, Lori. 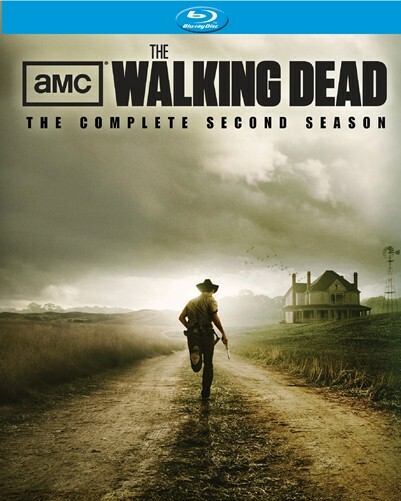 The Walking Dead: The Complete Second Season cast also includes Laurie Holden (Fantastic Four), Steven Yeun (My Name is Jerry), Norman Reedus (The Boondock Saints), Jeffrey DeMunn (The Shawshank Redemption), Chandler Riggs (Get Low), Iron E. Singleton (Seeking Justice) and Melissa McBride (The Mist). Guest stars for the second season include Lauren Cohan (Chuck), Scott Wilson (Monster) and Pruitt Taylor Vince (Constantine). The Walking Dead is a hit with both audiences and critics. The first season won the Emmy® Award for Outstanding Prosthetic Makeup for a Series, Miniseries, Movie or Special and was nominated for Emmys® in Outstanding Sound Editing for a Series and Outstanding Special Visual Effects for a Series. Season 1 also garnered a Golden Globe® nomination for Best Television Series – Drama, and was named to the American Film Institutes (AFI) Top 10 Programs of the Year (2010), among other accolades. Season 3 of The Walking Dead premieres on AMC in October.